It’s cool enough just to have one rock and roll icon playing your town on a Tuesday night. Put two legends together on the same stage and it’s, well…magic. 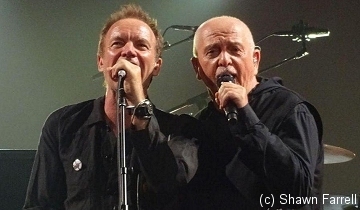 Sting and Peter Gabriel kicked off their joint Rock, Paper, Scissors tour last night with a three-hour show at Nationwide Arena in Columbus, Ohio, each man playing a solo set peppered with his own hits before joining forces for an unforgettable musical matchup.. Renowned for their work fronting two of rock’s most successful - not to mention influential - bands, the Englishmen seemed in good spirits (and excellent health). Gabriel rose to fame in the ‘70s as the costume-and-makeup-wearing mouthpiece for the art-rock quintet Genesis (1967-74). His first four eponymously-titled solo albums established him as a socially-conscious visionary with a gift for exotic rhythms and menacing verses. Gabriel metamorphosed into an MTV superstar in the mid-‘80s, while the ‘90s found the Real World guru reinventing himself as a divorced father at middle age. Sting combined elements of pop, punk, and reggae as singer / bassist for The Police (1977-1985). His solo debut The Dream of the Blue Turtles was a hit despite its jazz leanings. Subsequent releases Nothing Like the Sun, Soul Cages, and Ten Summoner’s Tales cemented his status as a hit-making philanthropist who’d do whatever he wanted - including a lute-centric album and Police reunion tour - with whoever he wanted, wherever he chose to do it. So two of England’s favorite sons landed in the Buckeye State on the first full day of summer, accompanied by a coterie of brilliant musicians who’ve all logged time with one or the other. The multicultural ensemble of men and women included two keyboardists, two percussionists, a violin player, two background singers, a guitarist…and Chapman stick player Tony Levin. Gabriel also played keys when not wandering the stage with a headset mic. Sting played one of his battered electric basses. “Invisible Sun” was the first of several Police cuts on offer. Indeed, Sting as many of those (“Message in a Bottle,” “Roxanne,” etc.) as he did solo selections. Sting joked that the evening would unfold like a “battle of the bands” between himself and Gabriel, but in truth both employed the same hybrid band - which minimized the need for set changes and technical adjustments. Crowding the expanse of the dramatically lit stage (with a dozen or so vertical LCD banners), the Rock, Paper, Scissors symphony shuffled between Sting / Police and Gabriel / Genesis fare with practiced ease. “We’ve been here rehearsing all week,” Sting reported early on. “Yes, I guess that makes us honorary Columbians!” quipped Peter. Gabriel dusted off So and Us smashes like “Red Rain,” “Sledgehammer,” “Don’t Give Up,” and “Kiss That Frog.” Further removed from his old band than Sting from The Police, Gabriel only teased vintage Genesis (with Sting chiming in on a couple verses). But classic ‘70s songs “Solsbury Hill” and “Games Without Frontiers” more than made up the difference between old and, ah…older PG. Gabriel issued the new single “I’m Amazing” last week but sang the even newer (and more topical) “Love Can Heal” for the intrigued Ohio crowd. But just because this was a musical match made in heaven didn’t mean either headliner skimped on his set. On the contrary, both Gabriel and Sting brought about fifteen songs apiece to the affair. And they all came off great. So nobody went home shortchanged. The pair first toured together in the late ‘80s (with Bruce Springsteen) for the Human Rights Now benefit concerts for Amnesty International. Tonight, they sounded telepathic and tight whether guesting on one another’s tunes or receding into the band as just another player, letting the other guy take over. The tour continues through the end of July. Check out more reviews from the opening show of the tour at http://www.sting.com/columbus where you can also leave your thoughts about the show, post your photos etc. Also remember to check and use the hashtag #RockPaperScissors on Twitter!